Hello! I am Peacefullwarior4 and I enjoy hanging out with and helping all of the students especially in SkyBlock. Limited resource survivals are the best! I am a home school mom that found this wonderful educational resource to help inspire my two children in the enjoyment of learning. 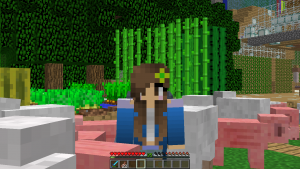 Because of my interest in their schooling I became directly involved in the world of Minecraft and eventually became a staff member and parent moderator in their favorite classes & mini games. If you want to get their attention, join in on the journey! If I am not in-game playing Minecraft, I’m usually hosting an organic veggie co-op, doing yoga, cooking, traveling, making jewelry, and of course spending time with my family!